Not content to stay on the mobile phones of millions of addicted fans, the Angry Birds are coming back to the big screen following the $352M success of 2016's The Angry Birds Movie. Following a recent teaser for the upcoming sequel, a new full trailer reveals the icy forces that have angry birds and their pig foes setting aside differences. 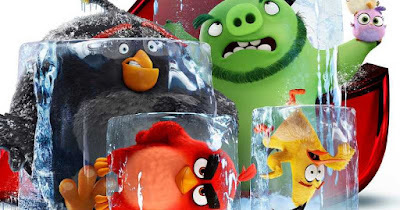 Jason Sudeikis is back as angry bird leader Red with Bill Hader voicing Leonard of the pig clan, and both sides must come together to stop a new threat. That threat would be Zeta, voiced by Leslie Jones, who is eager to leave her chilly surroundings and get what the other birds have. The sequel also features the voices of Josh Gad, Danny McBride, Peter Dinklage, Rachel Bloom, Awkwafina, Sterling K. Brown, Eugenio Derbez, Brooklynn Prince, and Dove Cameron. I hope those of you who buy tickets for The Angry Birds Movie 2 on August 16th get some kind of digital discount on the game or something.